Can a website design build trust? We certainly think so. 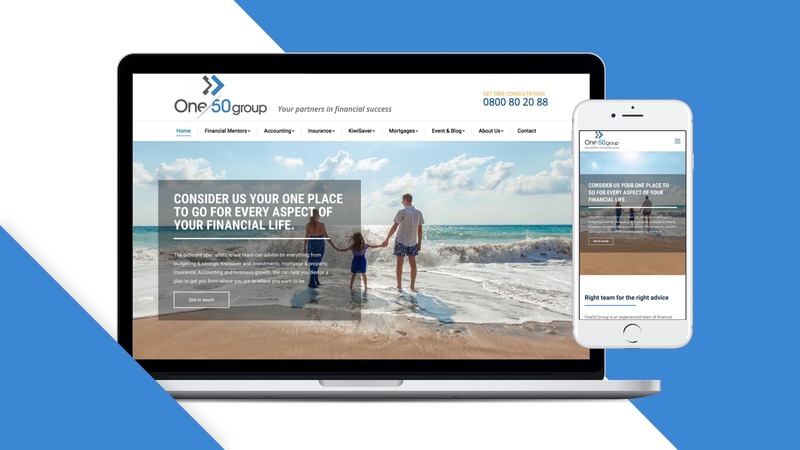 When One50 Group came to us with a request for a new website, we immediately realised how important it would be to make the design confidence-inspiring. 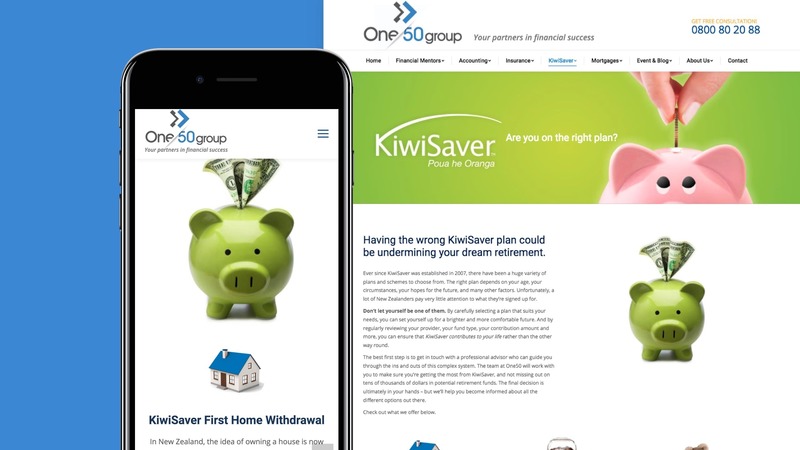 One50 is a Kiwi company that provides property investment, insurance, and tax advice. When you’re offering such crucial services with such high stakes, the smallest design flaw or unnecessarily complicated navigation menu will easily deter people from putting their faith in you. On the flipside, a fantastic website would reflect One50’s true strengths. So we created that website. We crafted a comprehensive, index-style home page. Not many people enjoy reading about financial services (though a good website can help a lot). For that reason, we wanted all the most important information to be in one place: the home page. With so much information to choose from, there’s a danger of overcrowding. 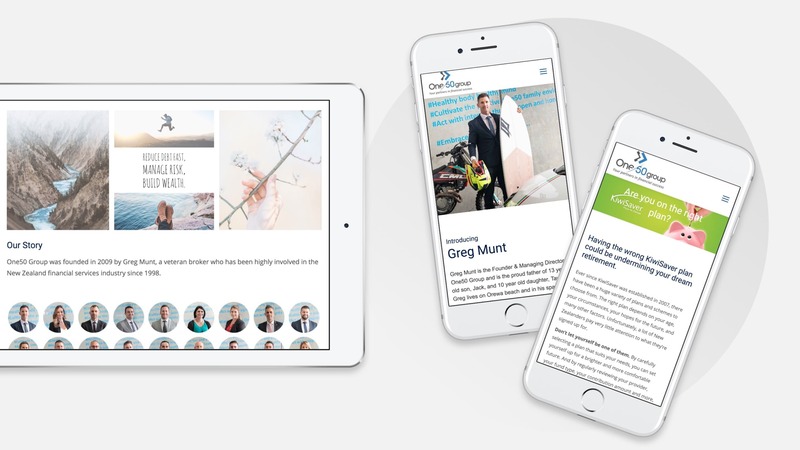 We came up with a rolling, layered home page – taking care to ensure an ideal balance of text and images. This home page contained all the information necessary to persuade potential clients that the One50 team knows what they’re doing. Above the fold, we included a clear summary and call to action. Further down, arranged in a strategic order, we carefully presented the most important points: the main benefits offered, the top reasons to choose One50 Group, a short blurb about the team, and so forth. All this was supported by customer testimonials, and contained a strong call to action encouraging people to get in touch. But we made sure the website had depth, too. Sure – we’d made a home page that would get people intrigued. But when you’re on the verge of investing in property, you want to be confident in your choice of broker. We therefore came up with compelling summaries of each and every service offered by One50, and organised these into logical categories and subcategories. Potential clients now find it incredibly easy to find and digest the information they’re looking for. The end result? A lower bounce rate, more conversions, and happier clients.